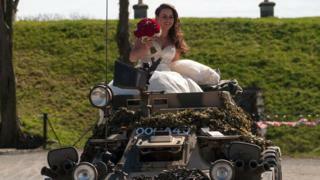 Image caption Don't Tell the Bride is currently one of BBC Three's most popular shows. The BBC Trust has approved proposals to move BBC Three online, on the condition that the channel's long-form programmes will be shown on BBC One and Two. "The decision to close a TV channel is a difficult one, and one we have not taken lightly," said BBC Trustee Suzanna Taverne. But added: "The evidence is very clear that younger audiences are watching more online and less linear TV." The channel will effectively go online-only from February. The decision follows a full public consultation over the proposed closure of BBC Three as an on-air channel. BBC director general Tony Hall announced in March 2014 that the youth-oriented channel would be moved to iPlayer, with its budget slashed from £85m to £25m, as part of "financially necessary" cost-cutting moves at the corporation. BBC Three - the original home to shows such as Gavin And Stacey, Little Britain and Torchwood - has been widely praised for its creativity and fostering of new talent. It is particularly popular with viewers under-25. On average, the channel is watched by 11.2 million people every week and reaches 25% of 16-24 year olds. However it is also currently the only BBC channel watched by 925,000 people in that age group - 80% of whom will "simply be lost" when the channel moves online, according to a public value assessment (PVA). So, from January 2016, the BBC Three TV channel will begin telling its audience to go somewhere else. It's not yet clear exactly how long the "migration" to online will take but the BBC Three TV channel will almost certainly have "gone dark" by April. What happens if you want to see the programmes but can't or won't go looking for them on the iPlayer? We are promised that all "long-form" BBC Three content will be shown on BBC One and Two and that some of it will be shown in peak time. What that means in practice is around two hours a week. It also means that some of that content may appear in the daytime schedules or more likely after 10pm. Finally, what happens if the number of young people watching BBC Three content plummets? The BBC Trust says it might then have to set quotas for how many BBC Three programmes are shown on traditional TV. On Thursday, the Trust report outlined a number of conditions that the BBC must fulfil to ensure those younger audiences are not left out. Among them, the Trust stated that the corporation must offer distinctive new programmes aimed at younger audiences, and continue commissioning risk-taking shows that experiment with new talent and ideas. The Trust said it would monitor the progress of an online-only BBC Three across the next 18 months, as well as checking to see whether the BBC was adhering to the terms set out in today's report. In February, a petition campaigning against the closure of BBC Three, signed by more than 270,000 people, was delivered to the BBC Trust. Stars such as Matt Lucas, Daniel Radcliffe, Olivia Colman and DJ Greg James have all spoken out against the on-air closure. Earlier this year, BBC bosses ruled out selling the station to a group of independent TV producers who stepped forward to try to keep it on TV and increase the budget, saying the channel "was not for sale". Jono Read, from the #SaveBBC3 campaign, called Thursday's decision "bitterly disappointing and...a very sad day for the future of the BBC". "With The Voice now lost by the BBC, it will save about the same amount they needed from closing BBC Three. But the BBC failed to make that connection." "It appears this is an example of young people being hit the hardest by cuts." Lord Hall has said the £30m saved by the closure of BBC Three will be invested in BBC One drama. He said the BBC was responding to "a very tough financial situation" adding: "Most importantly, it's a great opportunity to develop new formats, new forms of content and re-imagine what we can do for young audiences who are, as we know, increasingly online and on the go." BBC Three controller, Damian Kavanagh, echoed Lord Hall: "Today is just the beginning for BBC Three and our plans to transform our offer for young people," he said, outlining the channel's "reinvention" online and the thinking behind the transformation in a BBC blog. "We have lots of new content coming in 2016 and exciting new ways of delivering it in development," said Kavanagh. As part of Thursday's decision, the Trust also approved plans to extend the hours of CBBC to 21:00 GMT (two hours later than the current finish time of 19:00) and to develop iPlayer beyond a catch-up service, to include online-first and third party content. However, as mooted in June, the Trust formally rejected proposals for a new BBC One+1 channel, which it said would be at the expense of commercial rivals. It also gave the BBC three months to outline what it intends to do with the spectrum freed up by the closure of BBC Three next year.